In the new year we often commit ourselves to reading. If reading is part of your resolution, please consider my book #TheWalk that was released last October. #TheWalk is a great choice as your first book for the new year. 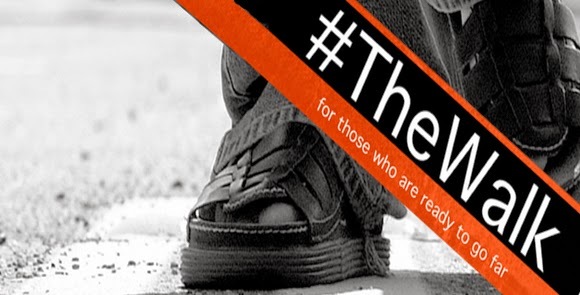 Why #TheWalk? January is a month of regret and resolve. Our regrets often give birth to our resolutions. The 7 pounds I gained from Thanksgiving to New Year’s Day has served to make dieting a top priority in my life. While weight, reading, saving, and time considerations often dominate the top of our list, there should also be some more lofty goals somewhere in the mix. Instead of only considering what we may lose, save, or manage, how about considering some things you would like to finish, start, or even create? It is difficult to be different. If you want your situation to change, you must change. The failure to be different is what usually trips up our resolutions. John Maxwell said, “You’ll never change your life until you change something you do daily.” It is at this point, daily change, that I believe you will find #TheWalk most helpful. #TheWalk is not about doing more, but doing less. It is not about meeting life goals as much as it is about doing something different daily. No matter how big or how small the objective before us, there is only one way it can be accomplished; one step at a time – walking! #TheWalk was born at the beginning of 2014 out of my own frustrations of having great ambitions, but feeling as if I had accomplished very little. While praying through Psalm 119:133 God opened my eyes to a revolutionary principle that has changed my life – steps. Rather than asking God to help me arrive at certain destinations or to accomplish certain long term goals, I now ask God one simple question each day, “What step do you want me to take today?” Breaking life down into steps has made me more content and effective in everything I do. I believe #TheWalk can do for you what the journey of preaching and writing it did for me – #TheWalk helped me be different. Here is a short excerpt from the book that I hope you will find to be helpful. I pray you will have a great 2015 and that you will consider adding #TheWalk to your book list this year. Honestly, I’m not a big fan of the circus. Even though there is a lot going on in the three rings, something about the chaos of it just doesn’t hold my attention. Trapeze doesn’t do it for me. If you are a circus clown and you are reading this book, I’m sorry to offend you, but what you do in the circus doesn’t connect with me. However, I would love to know how so many of you get in those little cars. Other than that, I’m not a fan of the clown. The dog trainer part of the show is absolute torture for me. They are about to fire a man out of a canon. Do the circus people seriously believe that a poodle hopping through a hoop is supposed to psyche me up for the human cannonball? Get the little dogs off the floor and let’s see a guy fly through the air like a missile. I see dogs everyday. Missile men – not so much. There is one point of the circus, however, that grips me. Bring out the lions and the tigers, and I’m all in. Those massive majestic animals are mesmerizing. Put a guy in there with the real potential of being mauled right before my eyes – I’m all over that – from a safe spectator distance, of course! Have you ever noticed that the lion tamer takes only two things into the cage with him? He takes a whip, which I can understand, and a chair, which I cannot. Yet in that infamous image of the lion tamer that is etched in our minds, you see only two things in his hands, a whip and a chair. Most of the time when we watch the lion tamer work his craft, we are excited by the whip, but think little of the chair. But the chair is the most important element of all. The whip has little to do with influencing the animals. With the whip, the lion tamer controls the crowd. We love the crack of the whip and, as humans, we are sympathetic to the sting. Indiana Jones may do it for humans, but Indy does nothing for lions. The whip may capture our attention, but it is with the chair that the lion tamer controls the beast. Lions have an impeccable ability to focus. When the end of the chair is extended toward a lion, the lion becomes almost paralyzed. Now, instead of focusing on one thing, the leg end of the chair presents the beast with four. The otherwise perfectly focused animal doesn’t know what to do next. He has too many choices to make. A powerful creature out of focus is ineffective. I find myself like the lion a lot of times. I have so much in front of me that I lose focus and become ineffective. I find myself looking at the leg end of the chair way too much. In a lot of ways, it is easy to become confused and paralyzed in your walk, wondering what to do next. You have too many things in front of you at one time. This is why priority is so important. When it comes to your walk, the first thing determines everything. With so many things in our vision, how does one possibly narrow it all down to one thing? The good news is that God has made it an easy choice for you. Remember, God has ultimately called you to do only one thing, walk in a way that pleases Him. What we eat, drink, or wear is the leg end of the chair. Jesus teaches us that if we can get those things in the right order of priority and make the one thing the main thing, all of those other things God will provide. Remember, He is the provider for those who walk with Him. That word seek, Jesus uses in the passage, means “to walk with focus.” It describes investigation and searching. You can’t seek several things. There is an old proverb that says, “He who chases two rabbits captures none.” The only way you can truly seek something is to get it down to one. If you could get four or five things out of your face and bring one thing into focus, it would help you go further. Why, because according to Jesus in Matthew 6:31-33, the first thing determines everything.